Excavating Egypt, The Egypt Exploration Society. The pop-up exhibition Excavating Egypt explores the rich and fascinating history of the Egypt Exploration Society. Through the Society’s extensive archive collection the exhibition allows visitors to access the lived experience of those who organised, directed, and took part in archaeological excavations in the Nile Valley from the Society’s foundation in 1882 to the present day. The focus of Excavating Egypt lies in the characters and stories that the archives reveal, providing first-hand accounts of developments in the discipline and an alternative perspective to the history of archaeology in Egypt. The exhibition is divided into four main sections: Prepare, Explore, Discover, and the Future. These sections guide the visitor through the process of organising and conducting an excavation, illustrated by archival images, documents, and personal anecdotes from the history of the Society. They cover everything from how to pick your team members and how to direct an excavation, to archaeological techniques and the conditions of living and working on site. The exhibition even explores the role of the archaeologist post-excavation, considering the Society’s responsibility to share its findings through the distribution of objects, the publication of results, and organising educational events for its members and the wider archaeological community. Visitors to the exhibition can explore a wide variety of archival material usually only available to researchers by appointment. Some of the highlights include excavation diaries, such as those from Emery’s excavations at Buhen in 1957/8, correspondence from early excavators such as Petrie and Naville, watercolour paintings by a young Howard Carter, and detailed object record cards from Pendlebury’s excavations at Tell el-Amarna. Film footage of Meir archaeological mission, 1950, projected on to tent canvas. Excavating Egypt provides some wonderful and unique ways of engaging with the archive collection. 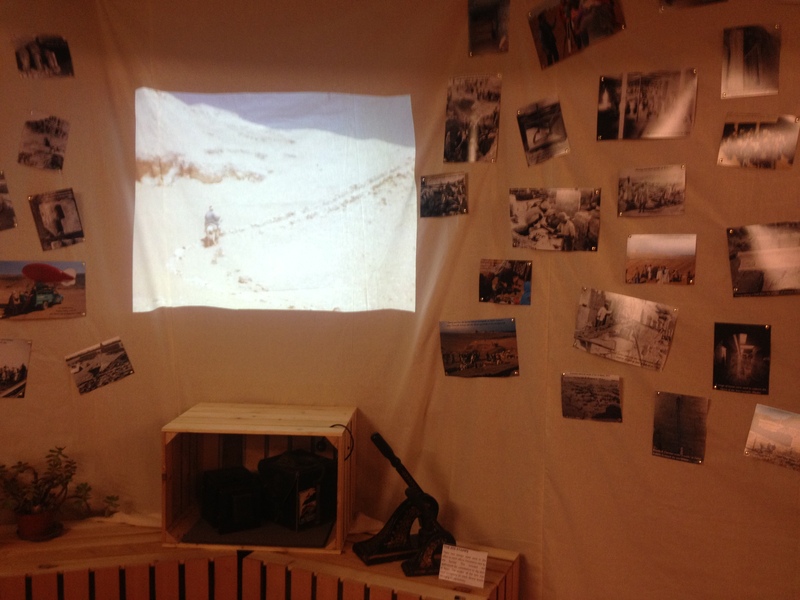 Original film footage of Aylward Blackman’s mission to Meir in 1950, entitled ‘To Work’, is on show continually throughout the exhibition, projected on to tent canvas and displayed alongside the actual camera used in its filming. The Society have also included some truly excellent 3D models of excavated objects which can be accessed by scanning object record cards on display using the Augment app. In addition to this, the display of original archaeological tools and replica artefacts arranged amongst object packing crates, similar to those used in early fieldwork, really helps to contextualise the material and adds an extra dimension to the archive experience. The exhibition, organised as part of the Festival of Archaeology, is accompanied by a great programme of events for visitors of all ages, including twice-daily tours of the exhibition, lunchtime lectures, and exclusive screenings of films from the archive. Younger visitors can get involved in a number of tailored activities too, including taking part in an on-site excavation and learning how to record and label their finds. 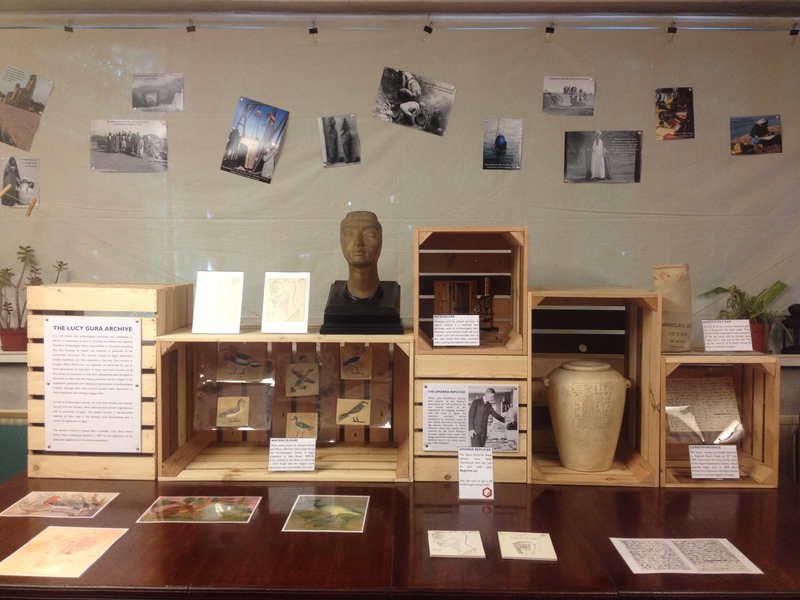 For those unable to attend the exhibition, you can find the text panels and some of the archival content on the Society’s pop-up website: excavatingegypt.wordpress.com. For more details of the Society’s Lucy Gura archive featured in this exhibition visit the EES website and their Flickr account where a great deal of the archive is being published online. ← Two Museums awarded funding for ancient Egypt galleries.